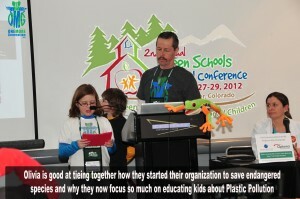 Olivia and Carter were invited to speak at the Green Schools National Conference recently in Denver Colorado. 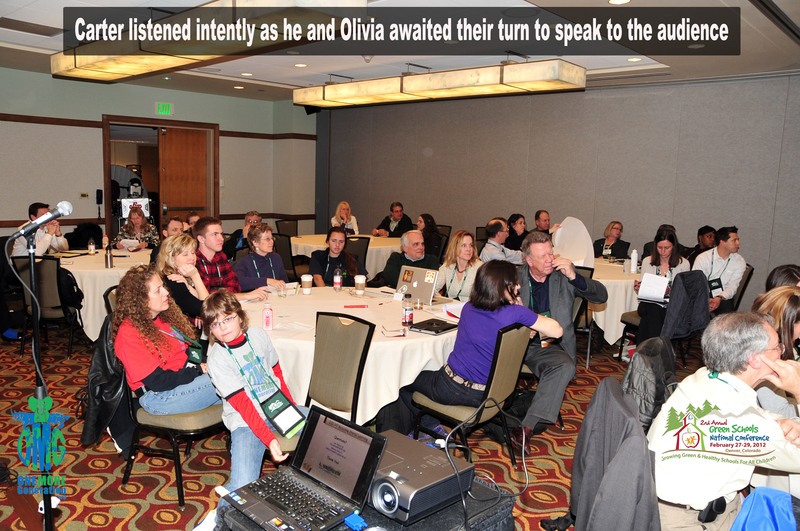 The conference is the only national gathering of K-12 leaders and educators coming together to make their schools and districts green & healthy centers of academic excellence. 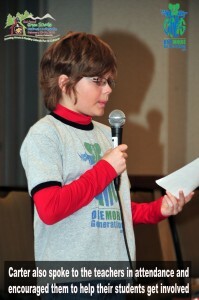 OMG was invited to present our Plastic Awareness Week curriculum program and to take part in a unique forum opportunity labeled Solutions Summits. In addition to traditional breakout session programming, the Green Schools National Conference took advantage of the experts and key stakeholders who were invited to attend the conference to initiate meaningful conversations to address real issues. The Solutions Summits brought key players to the table – literally around a table – for 3 or 4 hours in a facilitated discussion format to define and set goals for future action. The Solutions Summits were a major departure from the typical one-way information sharing that occurs at most conferences. 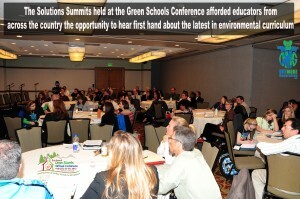 The Solutions Summits consisted of a cross-section of K-12, non-profit, for-profit and public sector stakeholders, all of whom are considered experts or pioneers in their respective field. 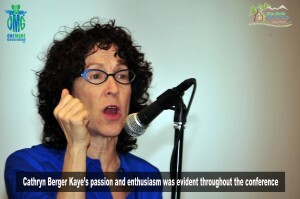 When planning such a extraordinary session for this years event, conference organizers had to invite someone special who had the ability to lead the experts and to ensure everyone understood the uniqueness of this opportunity, so they brought in Cathryn Berger Kaye, (M.A.) to design and facilitate this session. Cathryn’s work is in education and organizational development and she is well talented at framing opportunities for conversations that move us forward toward a more sustainable future. Cathryn is a Conference Keynote, Workshop Presenter, and specializes in Program Development. 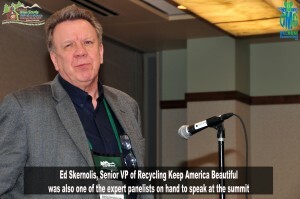 Johnnie Perkins, West Region Director of Municipal Services Republic Services, Inc. The Solutions Summit was extremely beneficial and many of the attendees came up to us after it was over and thanked the kids for all that they are doing to try and make a difference. 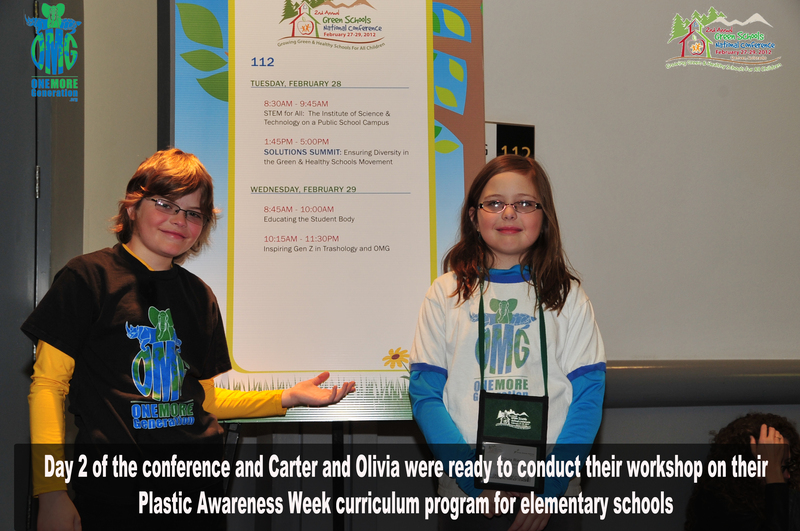 Cathryn invited Olivia and Carter to participate in the Solutions Summit because of all their hard work with trying to educate students about plastic pollution and because of everything they do to try and clean up our oceans. Cathryn even took time out to introduce them to someone they both admire a lot… Philippe Cousteau. Philippe is also the coauthor, with Cathryn, of Going Blue, A Teen Guide to Saving Our Oceans, Lakes, Rivers, & Wetlands (Free Spirit Publishing), which was released in the summer of 2010 and has been awarded Learning Magazine’s 2011 Teachers’ Choice Award for the Family, a Gold Nautilus Award and a 2010 ForeWord Reviews Book of the Year Gold Award, amongst others. Our second day at the conference started out with an extraordinary breakfast meeting with Laura Turner Seydel from the Captain Planet Foundation. 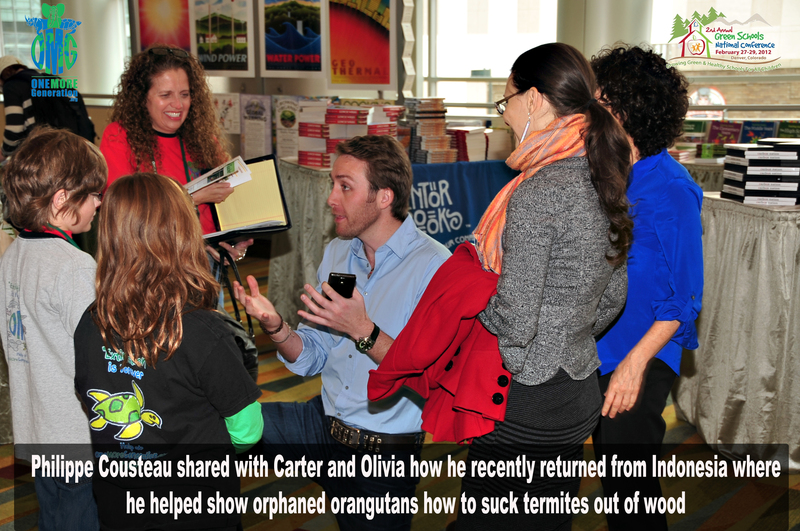 Laura was interested in learning more about all the initiatives Carter and Olivia have been involved in since starting their organization back in late 2009. She was so supportive of our efforts and she even gave us a ton of key contacts that we should reach-out to in order to ensure we can be successful with our efforts. Laura also invited Olivia and Carter to be part of their 10th Annual Earth Day Kids’ Fest with the Captain Planet Foundation and the Chattahoochee Nature Center. We are so excited to be part of this years event and we sincerely look forward to working with all the other great organizations who will be attending. We went over our Plastic Awareness Week curriculum program with Laura and she liked how in-depth the curriculum was. 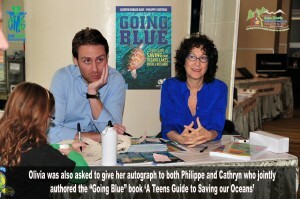 She even encouraged us to apply for a Captain Planet Grant where we could then bring our weeklong program to a local school free of charge to the school. We also presented our Plastic Awareness Coalition to Laura and she loved what the kids were trying to do with the coalition. She even committed to joining the coalition as well. 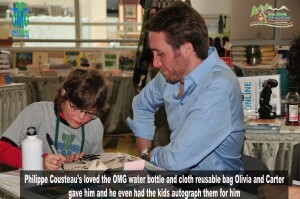 Laura was so supportive of the kids work and her enthusiasm was genuine and inspiring. Carter and Olivia enjoyed meeting her and we all look forward to a very productive partnership. Core Practice: Core Practice 1: Curriculum that Advances Environmental Literacy and Sustainability: Content areas are integrated by using environmental and sustainability topics and integrating them. Description: Trashology 101 is an integrated curriculum that engages students in hands-on, student-driven waste reduction activities which change behaviors at school and home. One More Generation (OMG) is a non-profit that educates students about plastic pollution and introduces alternatives to eliminate our plastic dependency. 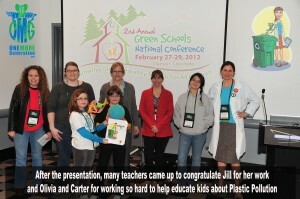 The presentation was designed to provide teachers from across the country to see and hear different and unique ways of introducing environmental education into the classrooms. 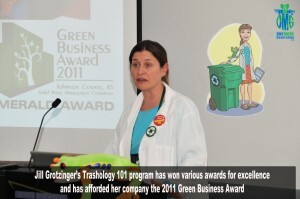 Jill did a fantastic job covering her Trashology 101 Waste Reduction Program for grades 3-5. The new curriculum is targeted to students in grades 3-5 (ages 8-11) and their teachers, families, youth-serving organizations such as scout groups, recreational clubs, and faith-based organizations. Through Trashology 101, young people will learn how they are connected to the environment, how solid waste management impacts the environment, and how they can personally make a positive impact in their school, home and community. 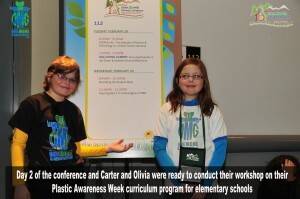 Olivia and Carter also took their turn presenting their Plastic Awareness Week curriculum program to the teachers which prompted numerous questions from the audience. Obviously their program is sparking a lot of interest. 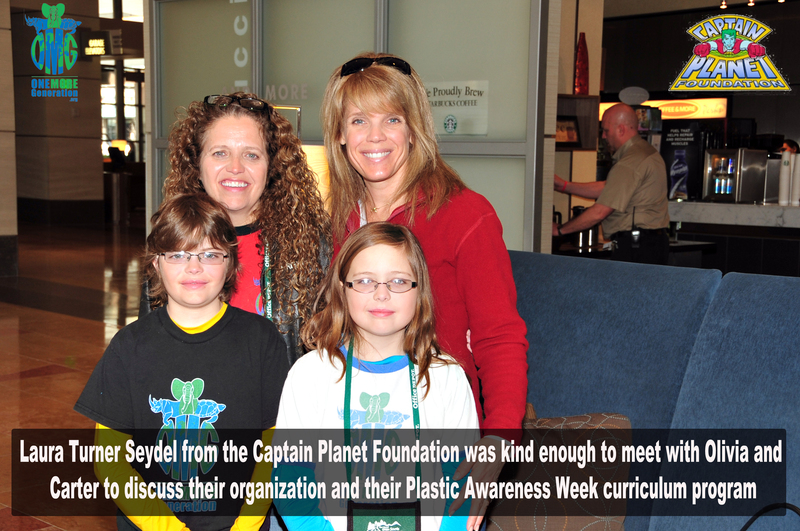 The goal of our Plastic Awareness Week program is to bring an in-depth curriculum to schools across the country which will engage and educate students on the issue of Plastic Pollution and bolster community wide recycling efforts. If you would like to learn more about our Plastic Awareness Week program, or about our Plastic Awareness Coalition, please send us an email and we will gladly help you out. 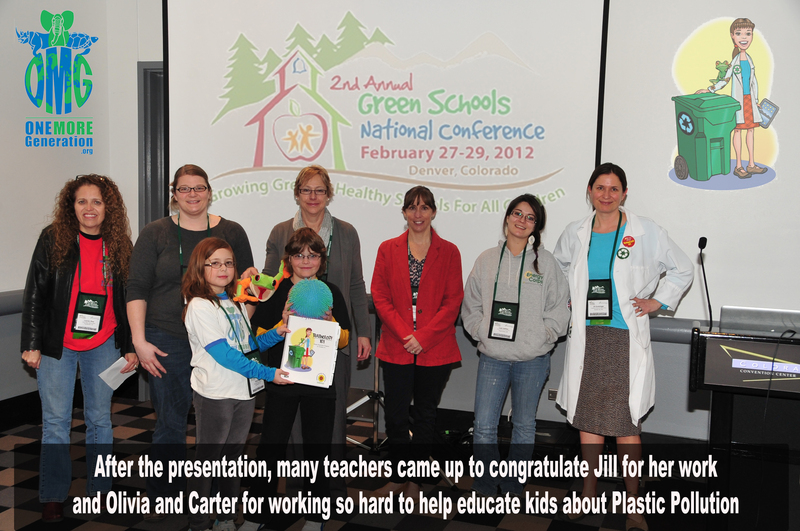 We wish to thank Cathryn Berger Kaye, M.A., Philippe Cousteau, Laura Turner Seydel, Bretta Beveridge who was the Producer of the 2nd annual Green Schools National Conference and Katie Howell who was the Programming Director/GSNC for all their hard work and support. 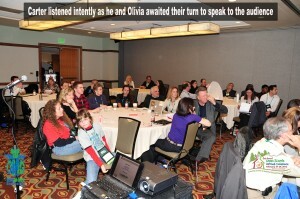 And also for allowing Olivia and Carter to come and present their program to the many teachers attending the conference. We learned a lot and hopefully we were also able to inspire others to want to be the solution to the issue of plastic pollution. 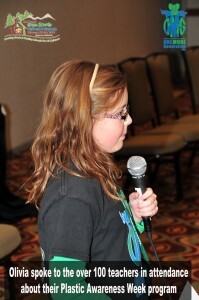 To see all the photos from the event please visit our FaceBook Photo Album and please be sure to hit the “Like” button.